3/27/2015IUSM Student-Invited Speaker 2015: Jonathan Clark, M.D. Every eight years, medical schools in North America begin a process of reflection and preparation, with the anticipated conclusion of renewed accreditation by the Liaison Committee on Medical Education, the accrediting body of U.S. medical schools. 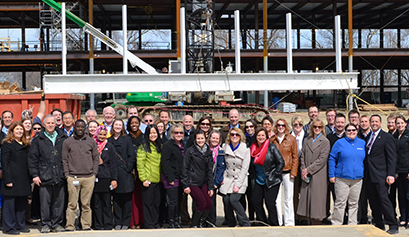 The IU School of Medicine has already begun the nearly two-year process of preparing for its LCME accreditation survey team visit in November 2016. Because every IUSM faculty and staff member will play an important role in this effort, a special website has been established to provide students, staff and faculty with information regarding the process and progress toward preparation. Visit the Road to Accreditation website to find answers to frequently asked questions about accreditation and to see pictures from a recent student event in support of the effort. The IU School of Medicine Orchestra will present its spring concert at 2 p.m. Sunday, April 19, at the Indiana History Center, 450 W. Ohio St., in Indianapolis. The concert is free and open to the public and will feature more than 40 talented medical and dental students, medical residents, faculty and staff of the IU schools of medicine and dentistry. Musical selections will include Beethoven's "Fidelio Overture Op. 72," "Mothership" by Mason Bates, "Micaela's Aria" from "Carmen" by Georges Bizet, featuring Maria Solis, MS4, as vocal soloist, and Mozart's "Violin Concert No. 2" featuring soloist Phil Palermo of the Indianapolis Symphony Orchestra. David Schurger is conducting. A coffee and cookie reception will follow the performance. This event is sponsored by the IU School of Medicine Office of Medical Service Learning. For more information about this or other service learning initiatives, contact Lisa Christy at christyl@iu.edu. ES 2129B, Study Abroad Office; contact Stephanie Leslie a slleslie@iupui.edu. MS 166, Office of Medical Service Learning; contact Lisa Christy at christyl@iu.edu. MS 158, Office of Financial Aid; contact Jose Espada at jespada@iu.edu. LO 200, Department of Family Medicine; contact Elly Elmessoussi at eelmesso@iu.edu. 10 to 11:30 a.m. Wednesday, April 8. 10 to 11:30 a.m. Tuesday, April 21. 10 to 11:30 a.m. Wednesday, May 6. Class sessions will take place in the Ruth Lilly Medical Library. EndNote is a software tool for publishing styles with bibliographies and storing the full-text documents. The classes are useful for staff, researchers and medical writers throughout the IU School of Medicine. To register for a class, contact Sherry Kieper at skieper@iu.edu. The IUPUI Office of Women is collaborating with IU Women in Technology and UITS to present a new series of workshops -- Tech Talks -- to help learners get the most out of technology. The first workshop is at 1 p.m. Tuesday, March 31, in the IUPUI Campus Center, Room 305. Michele Kelmer, IT Community Partnerships, UITS, is the workshop leader. Register online. IU Health has announced that Paul Haut, M.D., IU School of Medicine associate professor of pediatrics, will serve as interim president of Riley Hospital for Children at IU Health beginning April 17. Dr. Haut will assume this position as Jeff Sperring, M.D., departs to become CEO of Seattle Children's Hospital. Dr. Haut is currently chief medical officer at Riley Hospital, which has 430 beds and approximately 11,000 overnight stays each year. He became chief medical officer in early 2012, after the position was vacated by Dr. Sperring when he became CEO. Dr. Haut has a bachelor’s degree from Brown University and received his medical degree from the University of Arkansas for Medical Sciences. He specializes in pediatric hematology and oncology. Virginia Caine, M.D., associate professor of medicine, and Sheryl Allen, M.D., associate dean of medical student affairs and associate professor of clinical emergency medicine and clinical pediatrics, are recipients of the Center for Leadership Development's Minority Achievement Awards. Dr. Caine, director of the Marion County Public Health Department, received the 2015 Mme. C.J. Walker (Outstanding Woman of the Year) Award. Dr. Caine is one of the nation's premier public health practitioners and has worked to promote and advance public health locally, nationally and internationally through innovative programs and unprecedented collaborations. For example, Dr. Caine was chair of the Indiana State Board of Health's AIDS committee that established the first HIV/AIDS school guidelines in the nation to allow Ryan White to attend school. As co-director of the Indianapolis Healthy Babies Initiative, Dr. Caine was instrumental with community leaders in efforts that reduced the black infant mortality rate to its lowest level in the history of Indianapolis. Dr. Allen was chosen as the recipient of the Center for Leadership Development's Minority Achievement Award for Achievement in Education, Postsecondary. In her role as an academic physician, Dr. Allen has served as a mentor to pre-medical and medical students, as well as pediatric and emergency medicine residents. Serving as associate dean for medical student affairs, Dr. Allen is focused on improving the services available to students and has expanded programming by increasing the number of staff in the office. "Dr. Allen is interested in improving the quality and approach of medical education, promoting cultural sensitivity, and she encourages students to participate in service-learning projects to expand their experiences with patients from all walks of life," wrote Peter Nalin, M.D., IUSM executive associate dean for educational affairs, in nominating Dr. Allen for this honor. The Center for Leadership Development is a non-profit organization with the mission to foster the advancement of minority youth in central Indiana as future professional, business and community leaders by providing experiences that encourage personal development and educational attainment. Faculty promotion dossier materials for promotions effective July 1, 2016, are now available. Dossiers are due in the dean's office (Academic Administration) no later than July 3, 2015. Some departments may have an earlier due date, which can be obtained from the department chair or regional center director's office. Contact Lynn Wakefield at lwakefie@iu.edu no later than June 15, 2015, to inform the dean's office of intent to submit a dossier for promotion. Advice on dossier preparation is available from Deb Cowley at dcowley@iu.edu. Sample dossiers are also available. Nearly 120 medical students, their families and friends will pull on their gardening gloves and head to three inner city Indianapolis neighborhoods Saturday for the 20th annual Spring House Calls, the oldest service-learning project at IUSM. The volunteer crews will fan out in Haughville, Blackburn and a near-eastside neighborhood to perform yard work and landscaping at 35 homes and the Neighborhood Fellowship Church, 3102 E. 10th St., home of the IU Student Outreach Clinic, a free clinic opened by the students nearly eight years ago. The student-led event targets the homes of elderly, disabled or minority homeowners or fellowship halls to lend a helping hand. The students will begin the day at 8:30 a.m. at the Christamore House Family and Community Center, 502 N. Tremont St., Indianapolis. From there, the students will go to their appointed homes to remove weeds, plant flowers, mulch and perform other landscaping tasks. At 12:30 p.m., the volunteers and homeowners will gather at the Christamore House to enjoy lunch and a chance to connect and celebrate. 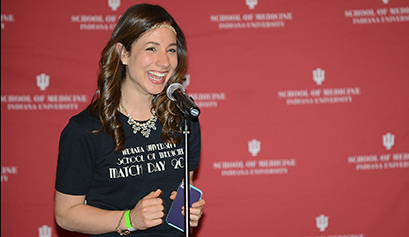 This annual event is coordinated, managed and conducted by medical students with support from the IU School of Medicine’s Office of Medical Student Affairs. The IUSM Boys and Girls Clubs service-learning group, in collaboration with Riley Hospital for Children at Indiana University Health, will host a bike safety helmet distribution from 5 to 7 p.m. Thursday April 9, at the LeGore Boys and Girls Club, 5228 W. Minnesota St., Indianapolis. During the event, IUSM students will measure the heads of children to ensure proper helmet fit. Safety stations and other activities also are planned. Thanks to funding from the student group faculty advisor, Richard Gunderman, M.D., Ph.D., through the AOA Medical Student Service Leadership Project grant, the students, in partnership with the Boys and Girls Clubs, will be able to provide 600 helmets to children at various clubs in Indianapolis. To participate or learn more, contact the student chairs, Samer Kawak and Daniel Hinds, at iusmbipp@iupui.edu. For information on any of the medical student service-learning groups, contact Lisa Christy at christyl@iu.edu. Qualified VA investigators (M.D, D.O., or Ph.D./RPh) with academic ranks not exceeding assistant professor and no current or prior history as principal investigators or awardees of NIH or VA funding. 5/8 compensated employees and should not be IPA/WOC unless the applicants have the intention of becoming 5/8 compensated VA. Applicants should focus their proposals on discrete projects intended to produce preliminary data in support of future applications for VA Career Development Awards or VA Merit Review grants. Intent to submit is due by Monday, May 4, and full applications must be submitted by Monday, May 18. Full application guidelines are available, as well as instructions for submission. Abstracts will be divided and compared by the following groups within each research category: clinical nurse, graduate student, medical student, post-doctoral/medical fellow, research technician and faculty (not eligible for cash award). Students, fellows and faculty conducting cancer research at IUPUI, Indiana University-Bloomington, Purdue University, and the Harper Cancer Research Institute, a collaboration of the IU School of Medicine and the University of Notre Dame, are eligible to present at Cancer Research Day. Cash awards will be given for best posters in each research category, by group. A panel of judges will be assigned to review abstracts and posters by research category and group. Complete the registration and download the abstract template. Deadline to submit is 5 p.m. Friday, April 17. The IU Simon Cancer Center Cancer Research Day will take place at the IUPUI Campus Center, 420 University Blvd., Room CE 450. The 24th annual Evening of the Arts will be Friday, April 11, at Crispus Attucks High School. EOTA is a variety program and fundraiser that showcases the talent of medical students, faculty, residents and community members. The event's mission is to provide financial assistance to medical clinics working to meet the health care needs of the homeless and working poor of Indianapolis and surrounding areas. Funds are raised at each year's performance through ticket sales, a visual art auction, and by donations from area businesses and individual sponsors. Proceeds are donated to medical clinics that provide care to the underserved population of Indianapolis. The four clinics receiving benefits this year are Genessaret, Saint Thomas, Wheeler Mission and IU Student Outreach Clinic. The silent auction begins at 5 p.m., followed by the variety show at 6 p.m. Tickets are available online or at the door. Cost for student tickets is $10 in advance and $12 at the door. Non-student tickets are $12 in advance and $15 at the door. "New Approaches to Neonatal Liver and GI Disease" is the topic of a symposium to be presented by The Makenna Van Laeken Pediatric Liver Disease Endowment and the Fourth Annual Neonatology Symposium. The event will take place Friday, Aug. 7, on the IUPUI campus. Total parenteral nutrition and neonatal liver disease. Neonatal hyperbilirubinemia, rare causes and management. IU Department of Physical Medicine and Rehabilitation faculty Flora M. Hammond, M.D. ; James F. Malec, Ph.D.; and Ralph M. Buschbacher, M.D., have written "The Handbook for Clinical Research: Design, Statistics and Implementation." Published by Demos Medical Publishing, the book provides practical insights and expert tips for successful research design, analysis and implementation. Peter Rosario, M.D., was named the 2015 recipient of the Gordon T. Herrmann Distinguished Service Award at the recent IU School of Medicine-Evansville Annual Scholarship and Awards Banquet. Dr. Rosario has been a volunteer clinical associate professor of medicine since 1991 at IUSM-Evansville. Before retiring, he practiced pulmonary medicine at St. Mary's Pulmonology Care Associates. Each year, members of the IUSM-Evansville faculty nominate volunteer clinical faculty members for distinguished service. The annual award honors physicians who work closely with IUSM-Evansville students and whose work in community engagement and excellence in practice exemplifies the physician-teacher. Jacob Shreve, a first-year medical student in the Schwarz Lab at IUSM-Notre Dame, received a 2015 Seed Grant from the American Medical Association Foundation for $2,500 on his project titled "Investigating Novel Therapies for Bronchopulmonary Dysplasia through Pathway Differential Expression."